In the past 12 months, three exceptional Arrowfield graduates of the 2017 Inglis Easter Sale have made the Stud’s 2019 invitation to discover greatness simply irresistible. Sensational colt The Autumn Sun, bought for $700,000, emulated his sire Redoute’s Choice and champion Pierro by winning three Group 1 races in his first six starts. He then stepped past those two great colts to add an out-of-this-world fourth Group 1 victory, the Randwick Guineas, at his eighth appearance, followed a fortnight later by a hugely courageous fifth Gr1 win in the Rosehill Guineas. The 2018 Golden Slipper G1 was won by the $1.7 million filly Estijaab (by Snitzel), who played catch-me-if-you-can with a quality field to win one of the world’s most coveted juvenile trophies. Australia Day this year brought victory in South Africa by Dundeel’s Arrowfield-bred son Atyaab. 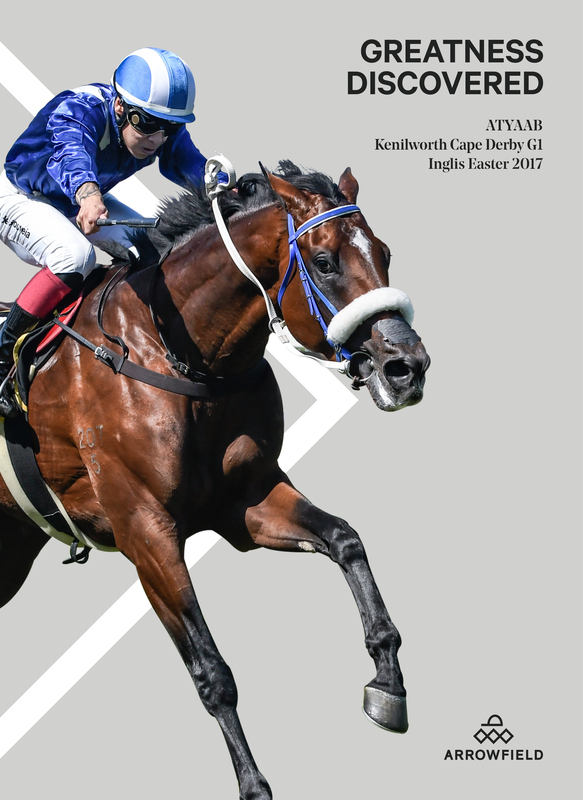 Bought for $260,000, he won the Kenilworth Cape Derby G1 at his 7th start for Sheikh Hamdan. Inglis Easter results show that the Messara family’s Hunter Valley farm has sent 9 Group 1 winners to the Sale over the past five years. That’s a third of all the Group 1 winners offered at the 2014-18 Easter Sales. Add the other eight Group & Listed winners Arrowfield has sold at Inglis Easter in that period, and the farm’s strike rate is almost twice the figure achieved across the entire Sale. The Stud’s 52-lot 2019 Inglis Easter draft is anchored by the late three-time Champion Sire and fair dinkum legend Redoute’s Choice, his sons the record-breaking Champion Sire Snitzel and super-versatile top 10 sire Not A Single Doubt, and major-sire-in-the-making Dundeel. That’s top-drawer stallion power in anyone’s language. John & Paul Messara and their bloodstock team pay just as much attention to the other side of the breeding equation. That’s why the dams of Arrowfield’s Easter yearlings include six Group 1 winners and 11 other Group & Listed winners. Buyers will also find siblings to The Autumn Sun, Dundeel, Hong Kong star Contentment, Japanese Group 1 winner Aerolithe and a dozen other stakeswinners. And, quite likely, their own slice of greatness.